to proceed dissolve yeast into half a cup of warm water with sugar and leave it in a warm place.............like in a preheated warm oven or on the side of gas stove where something else is cooking.........when the mixture becomes frothy which takes about 15 minutes, mix with flour, salt and enough milk to make a smooth pliable dough.........at this step any flavoring spice or herb can be added to the flour like black pepper powder, cumin seeds, coriander leaves or fenugreek leaves......,,keep the dough covered in a warm place again and let it rise to double it's volume...takes about half an hour.........now punch the dough and make portions like you make to prepare stuffed parathas......stuff the paneer mixture generously inside each flattened portion and keep covered for 10 -15 minutes....this will allow the balls to increase in size again. alternatively, the kulchas can be grilled in an oven at 180 degree C for about 5-6 minutes each....it is convenient to make it on tawa when making large numbers of kulchas. this is great like an Indian Enchilada! Sounds wonderful Sangeeta! 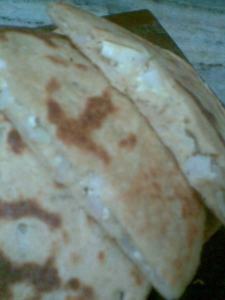 :-) Just wondering ... what is the difference between a stuffed paratha and a kulcha? I have always wnated to know. the kulchas look yummy I love paneer ...this seems to be a very healthy atta kulcha with paneer filling, I'll bookmark this recipe, thanks. chow n chatter ..yeah ot's like an enchillada only..
sharmila..the parathas are made with fresh dough and are made on tawa and are shallow fried in ghee n served hot....but the kulchas are made with fermented dough with yeast, roasted traditionally in a tandoor ...now a days in ovens,but i do it on tawa too esp. when many kulchas are to be made...also the kulchas are not smeared with ghee or butter while cookin...it's done after the cooking n can be served without butter...hot or cold. thanks suparna...these can be made in bulk and keep well in the fridge for a week...just microwave and serve with required accompaniment. yeah sunita ...it was for you dahling...you'll get it when you come here. that's some thick filling in there girl :D nice! thanks Shilpa, Pooja n Nags this is a hearty meal bit the photos are just crap...read it functional..he he.. wow..yummo!..I love paneer so much..!